Coinciding with the release of his latest 3CD collection ‘Metatronic’ and as part of Short Circuit 2010; an evening celebrating the best of British electronic music, JOHN FOXX headlined a special analogue synthesizer show to mark his 30th anniversary as a solo artist. 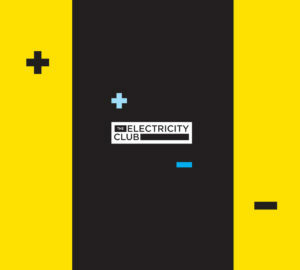 The Electricity Club happened to be present for his first solo show at Hitchin Regal during October 1983. 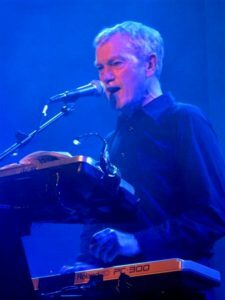 But on that occasion, JOHN FOXX appeared to have gone back to guitars, so much so that the entire ‘Metamatic’ album was omitted in a near Stalinist rewrite of history! He did however play songs from his ULTRAVOX repertoire, a body of work that influenced the young GARY NUMAN, contributing to his major success in 1979 with ‘Replicas’ and ‘The Pleasure Principle’. But tonight couldn’t have been more different as Foxx and an ensemble of special guests: Benge (synthesizers, percussion and bass), Steve D’Agostino (synths); Serafina Steer (synths); Jean-Gabriel Becker (synths and bass); and Liam Hutton (drums and percussion) took to the stage to perform material from the ‘Metamatic’ era AND a selection of ULTRAVOX material. 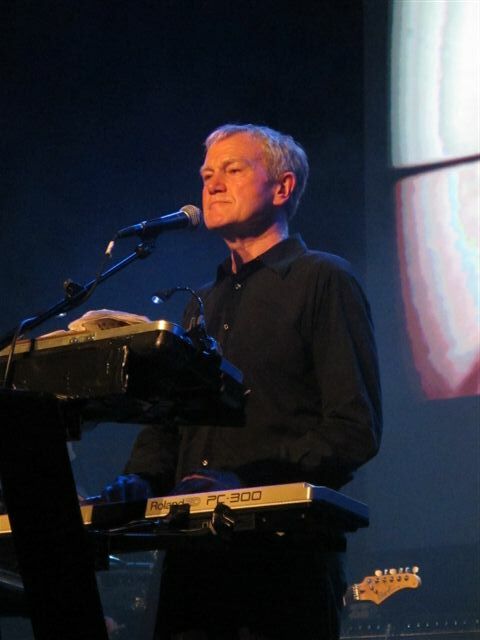 Also featured in themed episodes were songs with LOUIS GORDON and new material under the moniker of JOHN FOXX & THE MATHS. Prior to the main event, there was DJ sets by JORI HULKKONEN who finished his selection with his proteges VILLA NAH’s own ‘Ways To Be’ and Back to The Phuture’s Mark Jones who played a very electronic set ranging from THE NORMAL, CABARET VOLTAIRE and FAD GADGET to TUBEWAY ARMY, OMD and SOFT CELL. One pleasant surprise was the massive roar of approval that greeted the bleepy pulses of cult classic ‘Lawnchairs’ by OUR DAUGHTERS WEDDING, a sign that the crowd knew their synthesizer history. To start the show, there was an overture consisting of ‘Parallel Lives’, a cut-up film of Alex Proyas’ ‘Groping’ soundtracked by a 21st Century take on ‘Underpass’ B-side ‘Film One’. Using the machines that created the sound of the future such as the Minimoog, ARP Odyssey, Roland CR-78, Korg 700 and Roland System 100, the band took their positions but there was a lengthy silence before Foxx arrived on stage to open with ‘Plaza’. Sounding magnificent and full of body, its JG Ballard inspired line “I remember your face from some shattered windscreen” still resonates in this man machine love affair. 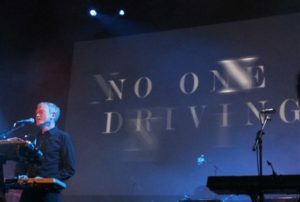 Accompanied by VJs Jonathan Barnbrook and Karborn stark filmic visuals throughout the show, B-side ‘This City’ comes next before an outstanding ‘Burning Car’. Taking on a hauntingly eerie significance, it recalls the autobiographical tale of an accident where everyone except the young Dennis Leigh was killed. The analogue goodness continued with excellent run throughs of ‘No-One Driving’ and ‘He’s a Liquid’ before ending the first episode with ‘Underpass’. Unfortunately, this classic is ruined by heavy speaker distortion and is something that would intermittently ruin several tracks played this evening. The band then vacated the stage for Foxx’s regular musical partner LOUIS GORDON to join him for three songs. Arriving to a big cheer, Gordon has to be the most enthusiastically intense synth player since Billy Currie. Bouncing around behind his keyboards, he was the total antithesis of FOXX’s largely static and cool stage persona. What they play is noisy and percussive; ‘Shadow Man’ is almost mutant EBM while ‘An Ocean We Can Breathe’ can only be described as metadelic, like an electronic version of The Fab Four’s ‘Tomorrow Never Knows’. The band returned to play THE MATHS set for what became a very hit ‘n’ miss section of the show. The best track was a song co-written with Mira Aroyo of LADYTRON called ‘Watching A Building On Fire’. Sung with Mira on the record but voiced totally by Foxx tonight, its chattering drum machine and accessible melodies make it stand out among the variable quality of new material that is showcased. Playing anything brand new live is difficult at the best of times but the crowd were beginning to get agitated, polite applause only greeting most of the finales. So when former ULTRAVOX guitarist Robin Simon took to the stage, everyone knew it was time for some more classic material and many who had slowly disappeared for a comfort break mid-show made a surge to the front. The seminal songs from the ‘Systems Of Romance’ album ‘Dislocation’, ‘Quiet Men’ and a superb ‘Slow Motion’ got the gig back on track to provide the end to the evening and probably got the biggest receptions of the night. Two encores followed which included a tremendous GIORGIO MORODER-esque re-working of ‘The Man Who Dies Everyday’ and the wonderfully beautiful ‘Just For A Moment’. 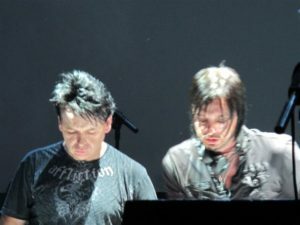 The evening was concluded with a DJ set from GARY NUMAN and ADE FENTON. The pull of a celebrity DJ is for all to see as half the audience remain in The Roundhouse to see Numan on his iPad with Fenton rather than leaving to beat the rush! Mixing in sections of KRAFTWERK and DEPECHE MODE to a set that included NEW ORDER’s ‘Blue Monday’ and BASEMENT JAXX’s ‘M.E.’ sampling ‘Where’s Your Head At?’, this is a sideline that provokes interest and attention from the plethora of Numanoids that have gathered. 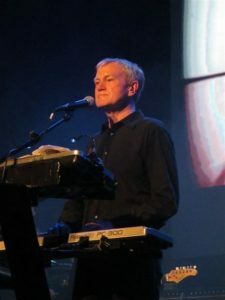 In all, an evening of mixed emotions but all due credit to JOHN FOXX for being willing to celebrate his history while still having the motivation and aptitude to produce new material that is still both innovative and challenging.